8th Annual Smoking Out Crime BBQ Cook-Off! 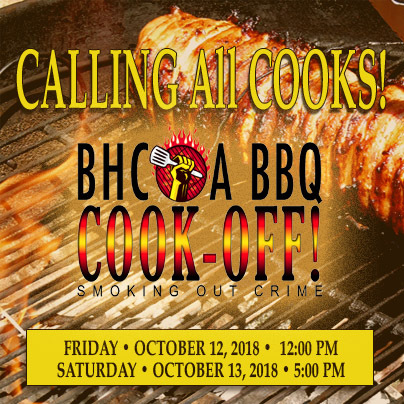 The Annual Block House Creek Smoking out Crime BBQ Cook-off is the biggest event put on by the BHC OA. This event is a community wide event, and open to all BHC residents. In addition to the Cook-Off, this year’s Smoking Out Crime event will feature a Crime Prevention and Safety Fair. Residents and BBQ team families will enjoy games, music, vendors and valuable information and services highlighting crime prevention and safety. The money to sponsor this event comes directly from BHC OA via assessment fees. All winnings that are awarded to the winning teams cannot be pulled from the BHC OA assessments. Your registration fee will cover the award money handed out to the 1st – 3rd place winners in all categories as well as Grand and Reserve Grand Prize. Registration for all teams is now open. Registration ends on October 7, 2018. The BHC Cook Off is a closed event, meaning you must reside in Block House to participate. The registration fee for Block House residents is $75.00. For the grandfathered teams that no longer reside in Block House but have a teammate that lives in Block House, your fee will be $75.00. If you no longer live in Block House, and do not have someone on your team from Block House, your registration fee is $100.00. Registration is non-refundable. Payment can be made by credit card or check. If someone has never cooked in the Cook Off and does not live in Block House, they are not eligible to participate as a new team. Please note – Per the BHC OA Board, if you reside in the Owners Association, you must be current on your assessments in order to be eligible to register for the Cook Off. Registrants who are not current on OA assessments will be cancelled automatically and registration fee returned. Teams will check-in on Friday, October 12th no earlier than 12:00 noon. Pre-assigned spots will be provided to each team. For additional questions regarding Cook Off registration or Cook Off procedures, please contact Corin Silva at 512-947-8058. For vendor inquiries and sponsorship information regarding the crime prevention and safety fair, please contact Corin Silva at 512-947-8058.